Director Mike Dougherty has announced that Godzilla: King of the Monsters is officially complete. Dougherty came on board to write and direct the project back in 2016 and filming started in June 2017, wrapping in September. Dougherty has been in the post-production process of getting all of the visual effects up to his liking and tweaking his initial edits, which by the looks of the first trailer, took quite a while. The visual effects truly look stunning, even from judging just the teaser. Godzilla: King of the Monsters features Rodan, Mothra, and King Ghidorah in an intense battle. Mike Dougherty already gave us a tease of the newcomers to the MonsterVerse with the first trailer, so to announce that the post-production process is over, he simply posted a picture of the opening titles. Dougherty also left a message to fans. "It is done. With love and gratitude to the thousands of talented people all around the world who helped make this lifelong dream a reality. In Godzilla we trust." 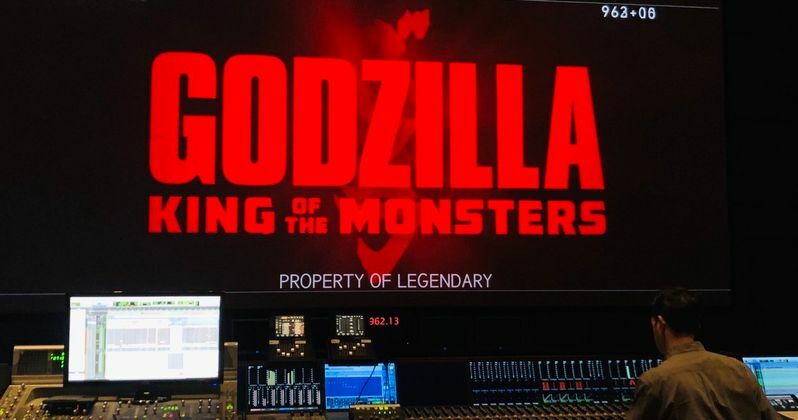 In addition to the awesome Godzilla: King of the Monsters trailer, the studio set up a Monarch website that lets users track Godzilla, Rodan, Mothra, and King Ghidorah, while also providing clues about the movie. It's like tracking Santa Claus on Christmas Eve, but with gigantic monsters that bring destruction instead of joy and presents. Some fans have come up with a theory that the movie will actually be an ancient rematch from clues that the Monarch website offered. That obviously has yet to be proven, but it's still an interesting theory. Stranger Things actress Millie Bobby Brown stars in Godzilla: King of the Monsters alongside Kyle Chandler, Vera Farmiga, Zhang Ziyi, O'Shea Jackson Jr., Sally Hawkins, Thomas Middleditch, Bradley Whitford, Charles Dance, and Aisha Hinds. The new story follows the heroic efforts of the crypto-zoological agency Monarch as its members face off against god-sized monsters, including the mighty Godzilla, who collides with Mothra, Rodan, and his ultimate nemesis, the three-headed King Ghidorah. While some may argue that the trailer gave away too much, there is still plenty that is unknown about the sequel. Now that Godzilla: King of the Monsters is officially finished, the shift moves to Godzilla vs. Kong, which is currently already in production. If seeing Godzilla go up against Rodan, Mothra, and King Ghidorah wasn't enough, Kong will certainly bring one of the greatest battles in history. The MonsterVerse is getting ready to spread their wings with these next two titles, so it will be very interesting to see how they end up performing at the box office. For now, Godzilla: King of the Monsters hits theaters on May 31st, 2019, while Godzilla vs. Kong comes out on May 22nd, 2020. You can check out the post-production announcement below, thanks to Mike Dougherty's Twitter account.